Would you like to be included in this directory? Would you like to report incorrect information or problems with links? If you have questions or would like to share your thoughts, please e-mail us. To be included in this directory please click here. We provide services for cattle, horses, small ruminants, and camelids. Hot iron branding, tattooing, castrating, and dehorning. The above is a listing of services and products available to cattle producers in South Florida. These are not paid advertisements and are provided as a free service for your use. This may not be a complete listing for each service, so other businesses can be added and a revised directory will be available on an annual basis. 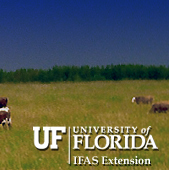 A listing in this directory does not imply an endorsement by the South Florida Beef-Forage Program or the Cooperative Extension Service, Institute of Food and Agricultural Sciences, University of Florida. Page last modified on April 23, 2019.